One of the most accessible Conference & Events venues in the Country. Located adjacent to the M621 motorway and just ten minutes away from Leeds train station, the venue provides hundreds of secure, complimentary car parking spaces to your guests & delegates on non match days. International visitors arriving at Leeds Bradford International Airport can also be at the venue within forty minutes. A1, M1, A639 to Leeds. Join M621 to Junction 1. Take A6110 from roundabout signposted for Elland Road. 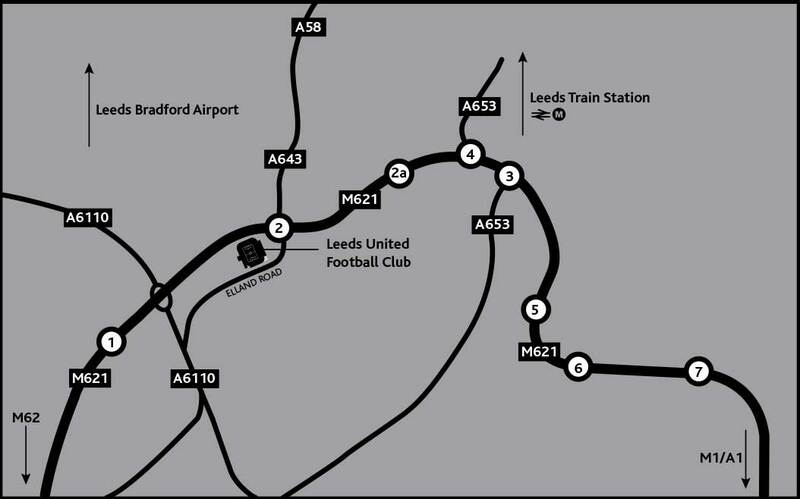 Alternatively from Junction 2 take first exit A643 from roundabout, stadium on the right. M1, M621 to Junction 1. Take A6110 from roundabout signposted for Elland Road. Alternatively from Junction 2 take first exit A643 from roundabout, stadium on the right. A64, A1, then as from North or M62, M621 to Junction 1. Take A6110 from roundabout signposted for Elland Road. Alternatively from Junction 2 take first exit A643 from roundabout, stadium on the right. M62, M621, to Junction 1. Take A6110 from roundabout signposted for Elland Road. There are hundreds of complimentary car parking spaces available on non match days. Leeds Railway Station is 2 miles away. Taxis or Public Transport are available to the stadium. Trainline is Europe’s leading train and coach app. We work with 207 rail and coach companies to offer our customers travel to thousands of destinations in and across 44 countries in Europe. Leeds Bradford International Airport is 12 miles away. Once again, the show never fails to deliver. An excellent day. Vendex was, as usual, the best one-day show of the year.